India has been consistently climbing up the Global Innovation Index since 2015, but it still has to improve on many indicators to catch up with China and others leading the table in the 126-nations list. 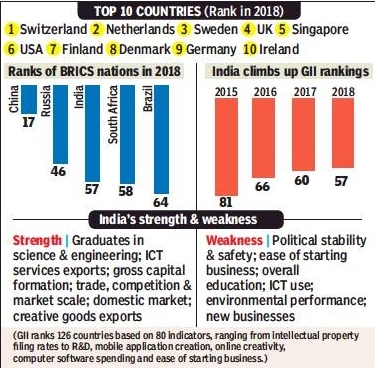 The 2018 rankings, released in New York, put India at 57th position and China at 17th as compared to their last year’s rankings of 60th and 22nd, respectively, providing an insight into their growing innovation capabilities and results. The rankings are published by the World Intellectual Property Organisation — a specialised agency of the United Nations — in association with Cornell University and graduate business school INSEAD. The Confederation of Indian Industry is one of the knowledge partners which assists the GII team in bringing out the rankings. India has maintained its perch at the top in the central and south Asia region, consistently moving up from 81st rank in 2015 to 57th this year. The GII report shows India has been improving its ranking on certain parameters which are flagged as the country’s strengths. It includes India’s human capital (graduates in science & engineering), growth rate of GDP per worker, exports of information and communication technology and services, productivity growth and creative goods exports, among others. However, the country fared badly on other indicators, including political stability and safety, ease of starting business, overall education and environmental performance.